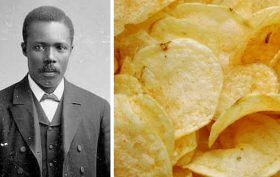 It was July, 1853, and George Crum was working as a chef at Cary Moon’s Lakehouse, an upscale restaurant in Saratoga Springs that catered to wealthy Manhattan families building summer escapes upstate. One of his customers sent back his French fries because they were thick and soggy (h/t NYT). After the man (who is rumored to have been Commodore Cornelius Vanderbilt, though this can’t be confirmed) sent back a second batch of the fried potatoes, Crum decided to get even, a decision that would land him a place in culinary history.